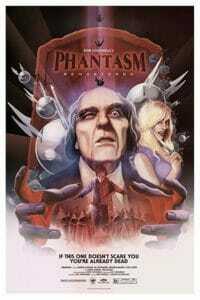 The TG Geeks recently learned of a special showing happening at the Alamo Drafthouse in Tempe AZ of the 70’s geek horror icon film Phantasm. 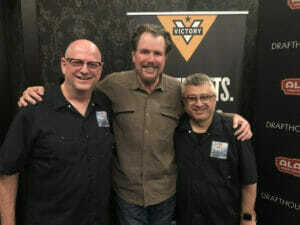 However there was more to this showing as it was learned that filmmaker Don Coscarelli himself would be present for this special showing of a restored print. 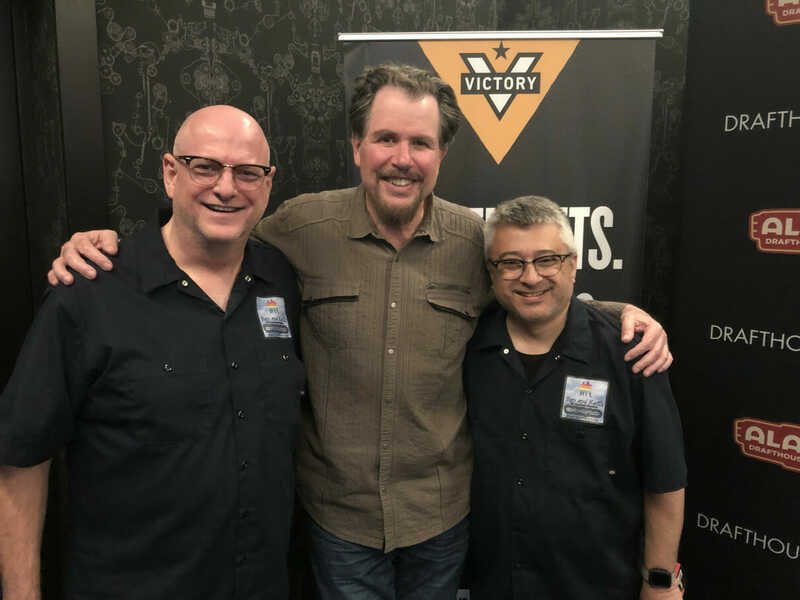 Coscarelli was also on hand to autograph his book “True Indie,” which was on sale for any theater guests in attendance that night. I learned of this special showing quite by accident early Wednesday thanks to a posting by Coscarelli himself on Instagram stating that he would be there. 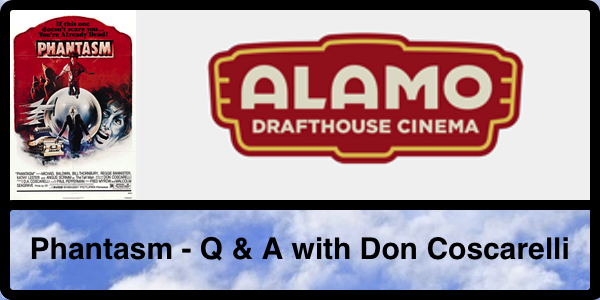 At first I believed that it would be impossible to make the showing since it was at 7:00 PM (Alamo Drafthouse Cinemas do not allow for latecomers to their main features), and since we were scheduled to do an interview for our website I felt that we wouldn’t make it on time. Keith was more optimistic. In fact he was almost insistent that I buy tickets for the event, so I did. In doing so I also learned of Coscarelli’s book “True Indie” and that Coscarelli would be autograph them there. Once our interview was over we immediately got into our car and made the drive to Tempe. Luckily traffic was relatively clear so we got to the Cinema with 10 minutes to spare. Keith bought TWO books for Don to autograph, which he happily (and I do mean HAPPILY) did, at which time I shared an amusing story from the first time I saw Phantasm during a midnight showing at the local theater in the town I grew up in, and how the final scene in the film actually scared a row full of high school football jocks. To say Coscarelli was pleased with this is an understatement. We then shared with him who we are and how much we would love to interview him at some time. We gave him our card and we then promptly made our way into the theater where this film was to be shown. 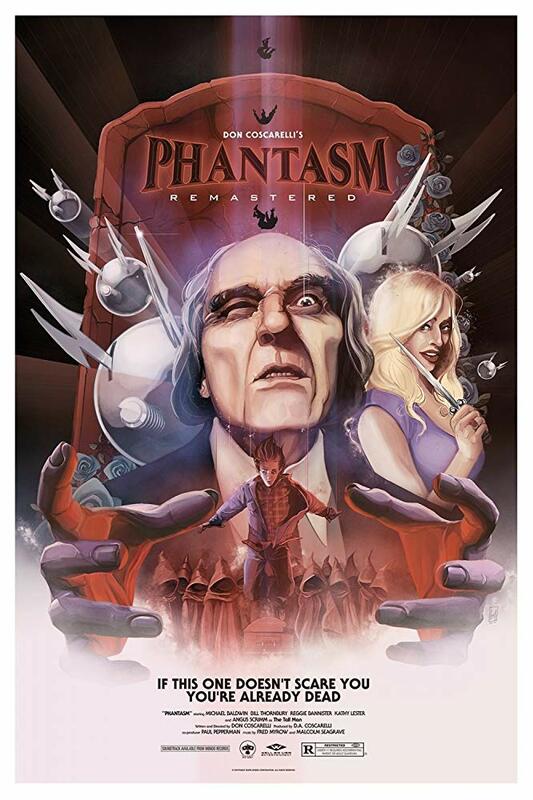 I won’t go into great details about Phantasm except that Coscarelli is an absolute visionary in creating something that didn’t resemble anything like the movies that were coming out at that time. You could almost call him the Mozart of horror films for that day. For those of you who have never seen this 70’s masterpiece, I will sum it up… Teenaged boy (Michael Baldwin), his older brother (Bill Thornbury), and their best friend (Reggie Bannister), investigate a mysterious funeral home where little creatures resembling midgets in brown, hooded robes are common place, death can come easily compliments of flying silver sphere that will burrow into your head, and they are all under the watchful eye of a mysterious mortician simply known as The Tall Man (Angus Scrimm). All hell breaks loose and hilarity ensues. The movie print looked absolutely beautiful, and the sound quality was incredible. This is important as not many movies back during the 70’s, unless they had big studio backing, employed multi-track audio. As for the movie itself, everything about it screams independent film. It has its story flaws, but that is part of its charm. It’s a thrill ride of a movie and many of those elements still hold up quite well. This might be the same print that was digitally transferred to the Blu-Ray set of the entire franchise, and while those later movies are also quite enjoyable, nothing beats seeing the one that started it all on the big screen. 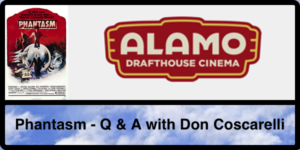 After the film was over the owner of Alamo Drafthouse came out again and introduced Coscarelli to the audience for a bit of a Q & A, which you can see below. After the Q & A we opted to get back into the autograph line (for those people who didn’t have a chance to get their books autographed yet) in the hopes that we could get a picture with Coscarelli (we were very rushed when we first arrived and didn’t think about it at the time), which we were successful with and you can see at the bottom of this article. To say that he is a genuinely pleasant individual is an understatement. The man is simply nice and friendly, and is happy to talk about his work and about movies in general. In other words, he’s a movie geek! Now I earlier said that we purchased two copies of “True Indie.” Don autographed both of them, with one of the copies to us and the other copy “To the lucky winner!” Yes, you read that right! We will be giving that autographed copy to a lucky reader/listener of TG Geeks sometime in the near future, so stay tuned!! !